Happy Fun Friday, SHINE friends! You girls seriously ROCK! I have not heard ONE single complaint from ANY of you precious little things this week due to the change in the reading plan. Nada. Thank you for rolling with it! That's exactly what I LOVE about all of you! Tomorrow we go back to one chapter a day. Shew. Since we have been heavy on the reading this week, I want to show you how THANKFUL I am for you! How about a Fun Friday SHINE girls give-away? 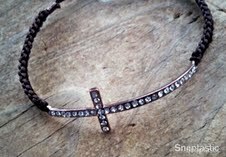 it's a copper cross bracelet! Tell us what you are THANKFUL for today! We love hearing your little hearts pouring out thanksgiving!